The Colorado Supreme Court on Thursday denied a petition by Gov. John Hickenlooper questioning the legality of Attorney General Cynthia Coffman joining a multi-state lawsuit to block the EPA’s Clean Power Plan. 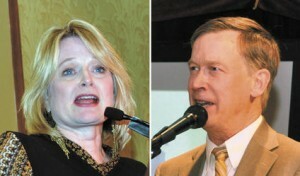 In denying Hickenlooper’s petition by a 5-2 margin, the Supreme Court said the governor already has an “adequate alternative remedy” and cited Salazar v. Davidson, a case in which then Attorney General Ken Salazar challenged the legality of redistricting law pass by the state legislature. Attorney General Cynthia Coffman, left, and Gov. John Hickenlooper. However, the court wasn’t clear what Hickenlooper’s alternative remedy is if he supports the Clean Power Plan, which seeks to reduce carbon emissions by 32 percent of 2005 levels by 2030, if the attorney general opposes and challenges the legality of the EPA rule. “The Supreme Court left undecided whether the attorney general can ​legally bring federal lawsuits on behalf of Colorado without the governor’s authority,” Hickenlooper spokeswoman Kathy Green said. “The Court did not deny the importance of this issue nor did it uphold the legality of the attorney general’s actions. Twenty-six states are currently challenging the plan, which will require power plants to switch to cleaner fuel sources other than coal or face shutting down, and attorney generals from 15 other states have said they will intervene in support of the plan. University of Colorado Law School Professor Mark Squillace, who specializes in environmental, natural resources and water law, said there’s nothing in the opinion about what Hickenlooper adequate alternative remedy is. “I can’t image what it would be short of the governor actually intervening on his own in the case on the side opposite the attorney general, and that would strike me as highly problematic to have the state of Colorado involved on both side of the case,” Squillace said. If Hickenlooper does intervene in support of the plan using independent counsel, Squillace added he would expect Coffman to then seek to block the governor. Conservation Colorado Executive Director Pete Maysmith released a statement encouraging Hickenlooper to pursue all legal options.